After posting the Plasma 5.14 “Cluster” wallpaper and asking for feedback there was a huge response, and after a few days of big changes and finer adjustments I hope this will serve as a satisfactory wallpaper. I’d like to thank everyone who offered constructive feedback, pitched in ideas, and even offered examples, you’re amazing! Cluster and the source SVG file are now available on OpenDesktop and the KDE Store. For those seeking the Krita source file, please contact me directly and I will ensure it’s available somewhere. 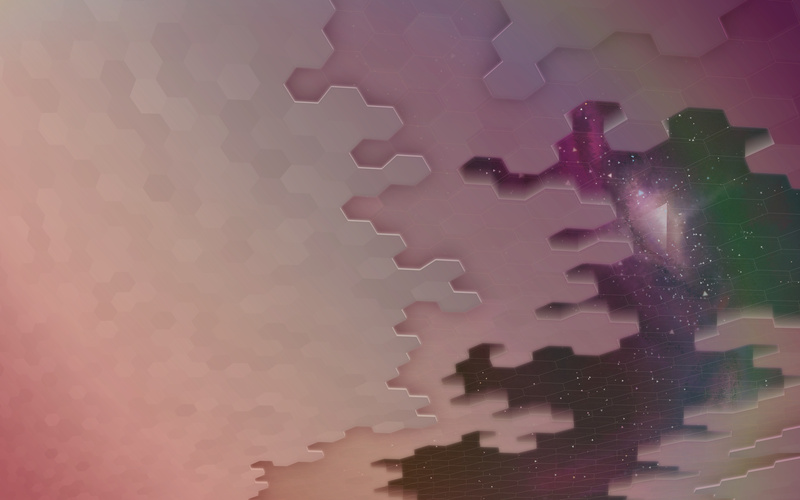 The time for a new Plasma wallpaper is here, so for 5.14 I’m excited to offer up “Cluster”. Now, with pixmaps there’s always a valid concern that higher-resolution monitors will suffer blurring because of low native resolutions. The master file for this slightly larger than 8k, so hopefully this will not be an issue. The only potential problem this causes is the large size of the master files. The Inkscape source will be published when the final wallpaper is released as per usual (just under 50MB), but the Krita-based assets are only going to be available on request. This is because the .kra is 135MB, and I have a feeling a few people might be angry if I load that onto the shared server. Unless they read this and tell me it’s fine. Who knows! Earlier this week I got my dirty hands on an RX Vega 64 card to run on my daily workstation. With the aim to eventually run open drivers in the future my main goal for now was to get AMDGPU-PRO running for day-to-day activities, possibly also moving to Wayland from X11. I’m very interested in Wayland as Kwin has several Wayland-only enhancements, and even if I wouldn’t use it now I wanted to be ready for testing. The Vega card would be replacing an Nvidia GTX 1080 card. In terms of usage I look to beefy video cards for when I do the odd video-related task, for applications like Krita, and other reasons up to and including general enthusiasm. Since it’s been a pretty rough experience I figured I’d blog about the state of Vega with Plasma, my opinions, and my hopes for the future. Because of the stock shortages which have been pretty persistent I ordered the standard edition sapphire card when I stumbled across one that somehow hadn’t sold out. I like the understated design of it, and despite its more simple looking build it does look and feel premium – moreso than it does in review videos. When active the Radeon text on the side glows red, and there is also a “GPU Tachometer” which shows the load on the card. There are also hardware switches which let you recolor or disable the LEDs. With the string change the installer worked without complaint, but I ran into another problem after restarting: the black screen of doom when graphics have failed to start. After researching I found it was caused because my installation of KDE Neon didn’t use the hardware enablement stack or “HWE” as offered by Ubuntu LTS. After I enabled the HWE I was able to get into an X11 session. Once I was in an X11 session screen tearing was fairly extreme. On researching I found out I could add the “TearFree” option in “10-amdgpu-pro.conf” to solve this issue. At this point I figured I solved all the major adoption problems to get back to my previous baseline from my time on the Nvidia card, so a reboot was in order to try out a clean session. Have you picked up that I’m not providing exact instructions on how to run AMDGPU-PRO drivers on Neon with Vega? It’s because as of the time of this writing, the experience is isn’t day-to-day usable and I won’t instruct you into a sub-par session. The drivers are still very new, and after I write this I’ll be re-installing my Nvidia drivers until I can try a Mesa session on stock kernel drivers. Applications which make use of hardware acceleration will cause the system to stutter and hang, sometimes for a few seconds. My only conclusion given the hardware on my machine is that the PRO drivers have issues. I also find that sometimes opening applications at all will cause a momentary hang, with Kate causing a several second freeze which only fixed itself as I began reaching for the power button. These are also complete system locks at the kernel level, as I’m unable to switch to the TTY interfaces and manually restart the session or kill applications. Game performance – as much as I “game” – is lackluster and glitchy under AMD. Remembering those reports of “Nvidia only” games on Linux I can suddenly and clearly understand why this is the case. I ran several of my neglected games from Steam and even a game like Factorio had glitches, while others like Rocket League were unplayable. Many were good, but all suffered performance issues. I think there’s an issue with loading and unloading data to the GPU, because the worst hangs seem to be during these steps. Rocket League took nearly 10 seconds to close and locked my entire system at this time. I simply gave up at this point with further game testing, being happy with none of the samples I tried. I was unable to get Wayland working at this point. I’m sure I could have if I really wanted to, but my initial impressions with an X11 session were so lackluster that I decided anything Wayland would fix are still far outweighed by the general driver itself. For even simple desktop work there have been minor visual glitches, and I’ve caught moments of tearing several times despite being in TearFree mode. In theory I could have used my Intel graphics to drive my displays, and there are instructions for doing this with Mesa drivers in headless mode on the AMD card. This would have let someone solve these problems, but sadly I didn’t have the outputs on my motherboard to support 2 Displayport displays and an HDMI tablet to try this. I don’t know how much I want to ream on AMDGPU-PRO drivers or Vega at this point. While KDE Neon uses Ubuntu LTS as a base system, technically, the PRO drivers did state they weren’t compatible with my system. At the same time I know in theory they shouldn’t be having problems. To a large degree I also expected the relatively overpowered card when used in my actual day-to-day activities to make up for any driver performance issues – I was banking on that. I don’t actually play my games so I don’t need Bioshock Infinite to run at 120fps – I need my desktop to run at 60. I either underestimated how badly the driver performs, or simply hit the wrong bugs, because for every minute of smooth operation I had with the driver there’s a hard stutter, hang, or jitter. If you run Neon I can’t recommend a Vega card at this point, so I recommend you save your time and money until there’s an announcement stating that the generic Linux kernel can output to displays on Vega. At that point maybe even check back on my blog because I’ll be re-visiting Vega on Neon with Mesa, which from what I understand should be the experience I was expecting. Until then I’ll be putting the Nvidia card back into my machine for a stable desktop, as AMDGPU-PRO+Vega+Neon results in an unusable system at this point in time. After posting the image of the 5.11 wallpaper feedback started coming in and one thing fairly consistently mentioned is how dark/muted it is. Of course, there were mixed opinions on whether it was good to be dark or if it was a little too far, but it was a clear observation, especially compared to the previous wallpapers. So I took a few minutes to adjust the wallpaper. There were lots of people who liked having something more subtle, so I didn’t stray too far. I adjusted the blues to be more saturated, the browns are lighter towards the bottom to reduce banding, the orange is a bit brighter, and reds on the right were tweaked. I also reduced an “atmosphere” gradient. Lastly, I removed a noise filter used to combat banding. Overall it’s not that much lighter, but it should be less muddy and washed out. If you didn’t have them side-by-side ideally you may not notice the changes, but hopefully it just feels a bit better. Both versions are available on the KDE Store. Today I streamed the first half of the Plasma 5.11 wallpaper production, and it was an interesting experience. The video above is the abridged version sped up ~20x, heavily edited to the actual creation, and should be a fun watch for the interested. It looks like there’s another full work-day that needs to go into the wallpaper still, and while I think I’ll also record the second half I don’t think I’ll livestream it; while I’m very appreciative of the viewers I had, it was quite a bit of extra work and quite difficult to carry on a one-man conversation for 8 hours, while working, for at most a few people. Like I said, I will still record the second half of the wallpaper for posterity, I simply don’t think I’ll be streaming it. I do think I’ll keep streaming the odd icon batch, as those are about as long as I want, so they can be kept to a digestible hour. The wallpaper as it is is based on an image of a reef along with a recent trip to the beach during the Blue Systems sprint. There’s still a long way to go, and I can easily see another 8 hours going into this before it’s completed; there’s water effects, tides, doing the rocks, and taking a second pass at the foam – among other things – especially before I hit the level of KDE polish I’d like meet. Looking at it, I may also make a reversed image with only the shoreline components for dual-screen aficionados.